Zephyr United is a small Montana-based company consisting of Zephyr Conferences, Zephyr Adventures, and Taste Vacations. Zephyr Conferences operates five wine, food, and beer conferences each year including the Wine Marketing & Tourism Conference and the Wine Media Conference (previously the Wine Bloggers Conference). Zephyr Adventuresconducts active tour vacations around the world, including tours such as Hike & Bike in Rioja; Hike, Wine, and Safari in South Africa; Multisport Tour in Chile and Argentina; and more. Many of our tour locations are in wine regions. Taste Vacations is a tour company focusing excusively on wine, food, and beer vacations. In the wine industry, we operate wine vacations in areas such as Sonoma, Washington, Spain, and Argentina. The next Wine Marketing & Tourism Conference will take place in March 2020 in Eugene, Oregon, in the southern Willamette Valley. We have an all-new agenda planned for this, our ninth conference. Nationally-recognized industry experts will come to Eugene to offer four two-hour workshops on the subjects of Marketing, Tourism, Sales and Service. Each workshop will offer concrete information and real life examples applicable to the audience. The Wine Marketing and Tourism Conference has announced two keynotes for its 2018 event, to be held October 23 - 25 in Santa Rosa, California. Michael Thomas, Principal Analytical Lead at Google, will provide insights into incorporating digital tourism practices to your current program that will help drive consumers to your door. And, back by popular demand, we have added Judd Wallenbrock, President & CEO of C. Mondavi & Family, as the closing keynote speaker. Judd will share his many years of experience in the wine industry on trends affecting marketing, tourism, and events. 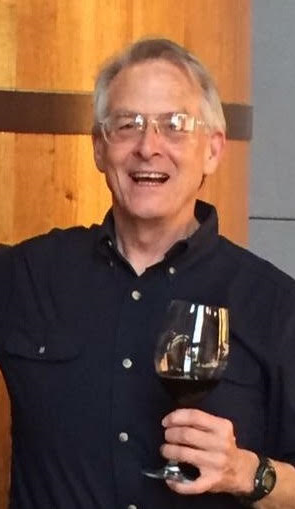 Lew is currently Publisher and Executive Editor of Wine Industry Insight, as well as Chairman of the Center for Research on Environmental Chemicals in Humans. Wine Industry Insight’s daily News Fetch email briefing enjoys the largest daily subscribership (25,000+) in the North American wine industry. He founded Wine Business Monthly in 1991 and Wines West, a Los Angeles-based wine importer/wholesaler/distributor specializing in high-end Italian brands. Lew has served as a top aide to a U.S. Senator and a state governor, run Congressional races, worked as a Washington correspondent (Ottaway/Dow-Jones, States News Service), a columnist for Gannett, The Wall Street Journal Online, CBS Marketwatch and TheStreet.Com. He has served on the faculties at UCLA and Cornell University, authored 22 published books including The French Paradox and Beyond, the Wrath of Grapes and several bestselling thrillers (LewisPerdue.Com). Lew is currently developing Clans, a patent-pending recommendation algorithm that is far more accurate than any other in use for wine, music, books, movies and other products. He is currently Co-Principal Investigator, Stealth Syndromes Human Study and has recently wrapped up three years as Chief Marketing Officer at TM Technologies. The next registration deadline for the Wine Bloggers Conference is June 30th - the current registration rate of $145 for Citizen Bloggers and $445 for Industry will go up July 1st to $170 and $470, so register by June 30th to get the best price! Lewis Perdue, Publisher and Executive Editor of Wine Industry Insight, will be this year’s Keynote Speaker at the Wine Bloggers Conference in Walla Walla, WA in October. Wine Industry Insight’s daily News Fetch email briefing enjoys the one of the largest daily subscribership (25,000+) in the North American wine industry. He founded Wine Business Monthly in 1991 and Wines West, a Los Angeles-based wine importer/wholesaler/distributor specializing in high-end Italian brands. The Wine Bloggers Conference announced it will be heading to Australia in 2019. Date and city are still to be decided. Typically, the next year's location is announced live at the current year's conference. This year the Wine Bloggers Conference will take place October 4 - 7 in Walla Walla, Washington. However, given the distance to be traveled for North American participants, conference organizers decided to announce the destination now. The Wine Bloggers Conference is working with the local group Wine Communicators of Australia to bring the conference there. For more information, please contact Allan Wright at allan@WineBloggersConference.org. The Wine Bloggers Conference has issued its Call for Content and Speakers for the 2018 conference, to be held October 4 - 7 in Walla Walla, Washington. The Wine Marketing & Tourism Conference has issued its Call for Content & Speakers for the 2018 conference, to be held October 23 - 25 in Santa Rosa, California. Both conferences are run by Zephyr Conferences. The Wine Bloggers Conference will be heading to Walla Walla, Washington in 2018, Zephyr Conferences recently announced at the conclusion of the 2017 conference. The 2018 event will take place October 4 - 7. The WBC last visited Walla Walla in 2010, the third year of the conference, and it was one of the highest-rated conferences in the ten-year history of the event. The town itself is amazingly cute, the wines of Washington are outstanding, the host hotel the Marcus Whitman is a gem, and local support is terrific. That local support is extremely important to the success of the Wine Bloggers Conference. In 2018, the event's main local partners are Visit Walla Walla and the Walla Walla Valley Wine Alliance. Zephyr Conferences also recently announced the Wine Marketing & Tourism Conference will remain in Santa Rosa in 2018, for a second year. Todd Derum, Division Chief of CAL FIRE in Sonoma County, will be addressing Wine Marketing & Tourism Conference attendees at an optional dinner on Tuesday, November 7th at the Hyatt in Santa Rosa. Chief Derum will address the fires in an informal talk with attendees. "We are used to responding to fires that impact others," said Durham in explaining what he will address at the talk. "It is a lot different when my staff members, too, are losing houses and being evacuated. These fires presented a great deal of challenges that taxed all fire authorities and communities affected." The dinner is open to all wine and tourism industry attendees whether registered for the conference or not. Learn Tasting Room Management from four industry veterans at a three-hour workshop from 1:30 - 4:30 PM on Monday, November 6 in Santa Rosa. The workshop costs only $125 and registration is available online. Or consider joining the entire three-day Wine Marketing & Tourism Conference for only $425. Prices for the 2017 Wine Marketing & Tourism Conference increase on October 1. The conference, slated for November 6 - 8 in Santa Rosa, California, is now in its seventh year. Optional three-hour workshops on digital marketing; photography and videography; tasting room management; best practices for tour operators; and Winery Associations and DMOs summit. Keynote from Carolyn Beteta, President & CEO of Visit California. Sessions on marketing to the luxury consumer, perfecting the guest experience, maximizing tasting room sales, working with wine tour operators, getting visual on social media, and much more. The conference is appropriate for tour operators, tasting room managers, marketers and communications specialists, winery associations, and anyone interested in wine marketing and wine tourism. The 2017 Wine Marketing & Tourism Conference, which will take place November 6 - 8 in Santa Rosa, California, has issued an open Call for Content & Speakers. All proposed sessions should be related to wine marketing or wine tourism. The best sessions provide real-world examples and offer concrete, useful takeaways for the audience, an expected 250 attendees from throughout North America. The Call for Content closes March 20. Eight Pillars of Digital Marketing: The content will be tailored to the wine industry and is applicable both to those relatively new to digital marketing and those more experienced. Practical Photography and Videography: We all know a photo is worth a thousand words and the future of online communication is video. Yet too many wine industry businesses are not equipped to take, edit, and promote either photos or videos – and not ready or able to hire a professional to do this for them. Tasting Room Management: This workshop will cover all aspects of tasting room management, including staffing (hiring, managing, and training), layout, pricing, selling, wine selection and pricing, wine club memberships, non-wine merchandise, setting hours, deciding on whether to require appointments, and more. Best Practices for Tour Operators: We will discuss selecting a niche, identifying your target market, insurance, employees, guides, pricing, selecting tour locations, running great tours, marketing, and soliciting feedback. Winery Associations & DMOs Workshop & Summit: Our presenters will include Ken Fischang, President / CEO of Sonoma County Tourism; Karissa Kruse, President of Sonoma County Winegrowers; and a representative of Sonoma County Vintners to be announced. All five workshops will take place on Monday, November 6 with the first two applicable to all audiences and the final three tailored to specific groups. Cost is $125 for one workshop or $200 for two and participants need not be registered to attend the entire Wine Marketing & Tourism Conference. See www.WineTourismConference.org for complete details. Prices increase January 1 for the conference! Next year will be the seventh running of the WMTC. Previous stops were Napa, Sonoma, Oregon, Paso Robles, Virginia, and Texas. Sonoma and Napa are, of course, the heart of the North American wine industry and this will make the conference more accessible to the bulk of the wine industry. In addition, 2017 marks the 10th year anniversary of the Wine Bloggers Conference, which will take place November 9 – 12 in the same hotel. This will allow wine industry participants from across the country to schedule one trip to participate in both conferences. Early registrations for the 2017 Wine Bloggers Conference are up 240% over the previous record attendance for the event. The conference will take place November 9-12 in Santa Rosa, California. Now, we are not expecting total registration to grow 240%. We don't have enough event space. But this is a serious indication of the popularity of the 2017 conference, thanks in large part to returning to the conference roots in Sonoma County and because next year is the 10th year of the conference. Register For the Conference: The conference is not just for wine bloggers but for any wine industry representative who is interested to learn about content and social media marketing or simply to meet and interact with wine bloggers. Stay Up to Date: Opt in to email updates each time we publish a news post, which will keep you updated about Calls for Content and other important events. Sponsor the Conference: Interested to pour your wine, meet bloggers, or host them at your local venue? Contact Reno Walsh (reno@zephyrconferences.com) for more information. The 10th annual Wine Bloggers Conference will take place November 9 - 12, 2017 in Santa Rosa, California. As of this early date, 105 people have already registered for the conference, making it on track to be by far the largest WBC ever with an expected 350 - 400 attendees. The Wine Bloggers Conference is the annual gathering of wine bloggers and wine writers, who not only write about wine but actively socialize their experiences and thoughts via their blogs and social media. Those in the wine industry looking to engage with these influencers or learn about blogging and social media are invited to attend. Sponsorship opportunities are also available to those wishing to pour their wine, host bloggers at their site, or simply promote their brand at the conference. Zephyr Conferences today announced the brand-new Beer Marketing & Tourism Conference will take place March 28-30, 2017 in Asheville, North Carolina. This is the sister conference to the existing Wine Marketing & Tourism Conference, which will be November 8-10 in Texas. The Wine Marketing & Tourism Conference is now in its sixth year and serves managerial and executive level industry members engaged in wine marketing or wine tourism. With the booming craft beer scene and Zephyr's existing involvement via the annual Beer Bloggers & Writers Conference, producing a conference for beer marketers was the natural next step. For complete information, please visit www.BMTCon.com. Stanchak leads mobile marketing strategy for one of the nation’s leading newspapers (look it up) and is the founder of Winery Passport, the wine industry’s most popular mobile app for winery tourism. In addition, Master Sommelier Andrea Robinson will be keynoting the Wine Tourism Conference. The Wine Tourism Conference, in advance of its sixth annual event in 2016, is changing its name to the Wine Marketing & Tourism Conference. Changing one’s event name could be seen as a pretty big deal. In reality, the change just reflects what the conference is already about: wine marketing and wine tourism. In fact, in many ways the two are so entwined it is hard to separate them. Wine tourism, of course, is simply the visitation of wine regions by travelers. From an industry conference perspective, our goal has always been to provide valuable advice on how to grow and improveone’s own wine tourism offering. And growing wine tourism is all about effective marketing. And so wine marketing has been a key component of the conference since the beginning. This past November, for example, we had content on digital marketing, no-cost guerrilla marketing, promoting your wine tourism business beyond your region, email marketing, and more. We do think wine tourism is a special component of the wine industry. Selling out the cellar door is a hugely important revenue stream for many, many wineries and focusing on tourism is a critical way to grow that revenue stream. So we will continue to offer lots of content focused on wine tourism but will also continue to provide what we think is top-notch marketing content specific to the wine industry. The Call for Content is now open for the 2016 Wine Marketing & Tourism Conference. 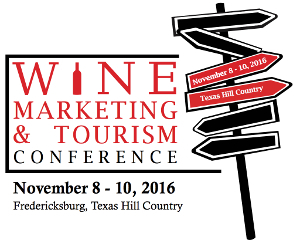 The 2016 WMTC will take place November 8-10 in Fredericksburg in the Texas Hill Country, which is currently experiencing a wine tourism boom. Approximately 180 attendees from around North America and the world, most at the managerial or executive level, will participate in the conference. If you are interested to present, please see the detailed information and fill out the application by February 26. After a successful conference November 18-20 in Loudoun County, Virginia, conference organizer Zephyr Adventures announced the 2016 Wine Tourism Conference will take place November 8-10 in Fredericksburg in the Texas Hill Country. For complete information, please see the 2016 location announcement. The Wine Tourism Conference is the annual event attracting wine tourism leaders from throughout North America and beyond. The 2016 conference will include networking, an introduction to Texas wine country, and content related to growing and improving one's own wine tourism offerings. Australia is at the forefront among nations promoting wine tourism at the international level and Sally Cope from Ultimate Winery Experiences Australia will be able to relate the success stories of Tourism Australia and Wine Australia. See the announcement post for complete information. The 2015 Wine Bloggers Conference recently wrapped up in The Finger Lakes, New York with an announcement the conference will head to Lodi, California in 2016. The conference will take place August 11-14 in Lodi, which has long been known for outstanding wine grape growing and has recently excelled in producing excellent wines as well. The Lodi WineGrape Commission will be the main local partner. The 2016 Wine Bloggers Conference is expected to attract approximately 350 attendees, most of them wine bloggers and writers from throughout North America and beyond. The conference is an excellent way to create relationships with the bloggers, learn about using blogging and social media to promote your own wine business, and potentiall sponsor the conference to pour your wines for attendees. Registration is now open and sponsorship information can be obtained from Reno Walsh via reno@zephyradventures.com. Zephyr Adventures, operator of the Wine Bloggers Conference, creates six annual conferences in the wine, food, beer, and fitness worlds in addition to running tours throughout the world. Wine Bloggers Conference Name Change in the Future? One of our primary goals as organizers of the Wine Bloggers Conference is to deliver an event that meets the needs of our community. The “new media” world of blogging and social media is not so new anymore and changes yearly, so to achieve our goal of meeting your needs we continually think about new ideas, solicit feedback, and make changes. One of the ideas we hear from our alumni is whether we should adjust the WBC to reflect the changing dynamics of wine blogging, professional wine writing, and social media. We recently conducted a survey of our alumni on this subject, with a specific focus on whether we need to change the name of the conference to be more inclusive to wine writers who are not blogging, and wanted to share the results here. Clearly, our alumni prefer to keep the Wine Bloggers Conference with its current name. Even more starkly, the “negative” response to the current name was only 19% – by far the lowest negative among any of the choices. Even those respondents who are not Citizen Bloggers preferred the current name. So the results are in and we will not be changing the conference name. We also asked whether there should be separate conferences for “wine bloggers” and “wine writers” and 87% said there should be one conference for both. This is a little contradictory since respondents did not want to change the name to include “writers” but the other survey questions and the many comments were very revealing. In general, Citizen Wine Bloggers are passionate about what they do (we all know that) but also proud of being a wine blogger. Most see themselves as wine writers but as very different from writers who have an editor or who get paid for their work. And they are proud they have chosen the format of a blog to express their views on the industry. Wine Bloggers should be respected for what they have achieved … a more open, democratic and vital forum about wine. This comment seems to sum up the attitude of the survey respondents. In essence, our alumni are telling us “We like being wine bloggers (or associating with wine bloggers). But we also welcome everyone to our conference.” That works for us and, in keeping with that spirit, we have added the tagline “Writing and social media in the wine industry” to our conference website. See you at the Wine Bloggers Conference this August. Taste Vacations, the luxury operator of food, wine, beer, and spirits vactions owned by Zephyr Adventures, has introuced a new four-day luxury wine vacation in Washington State. The tour spends time in the grape-growing regions of Southeast Washington including visiting wineries in the Columbia Valley, Yakima Valley, Horse Heaven Hills, Red Mountain, and Walla Walla Valley AVAs. The tour spends two nights in the small university town of Walla Walla and one night in Prosser. While Washington State has long been known for producing outstanding wine, it is still becoming established as a wine tourism destination. The Wine Tourism Conference will head to Virginia for its fifth event. The conference will take place November 18-20 in Leesbueg, Loudoun County, Virginia at the AAA Four-Diamond Lansdowne Resort. The 2015 event will be the first Wine Tourism Conference on the East Coast or, indeed, away from the West Coast. The conference has taken place in Napa, Sonoma, Oregon, and most recently in Paso Robles. Virginia has been a stronger support of both its wine and tourism industries and is thus making a mark in the combined wine tourism market. Virginia also served as host of the 2011 Wine Bloggers Conference and local entities are already lining up to support the 2015 Wine Tourism Conference. The Wine Tourism Conference is expected to draw 200 wine and tourism leaders from throughout North America and beyond. The conference focuses on providing concrete information participants can bring home to improve the size and quality of their own wine tourism offerings. Social media is changing the wine world among many other industries. The Wine Tourism Conference (November 12-14, Paso Robles) is pleased to have Alan Kropf from Mutineer Magazine present a keynote talk on Marketing Your Wine Tourism Business in the New Culture of Wine. The modern wine tourism consumer does not want to be marketed to. He wants to have a conversation with you. Negative reports of your business will happen. Don’t defend. Acknowledge. Marketing is now more than just reaching new consumers. It involves creating interesting content and educating your community. The new consumer is willing to pay more for a more personal experience. She wants to have special experiences and a connection with you, the provider. For complete information and to register visit www.WineTourismConference.org. Zephyr Adventures is launching a new wine, beer, spirits, and food tour company called Taste Vacations that will offer upscale vacations around the world. Zephyr Adventures has been offering active tours around the globe for the past 17 years, with a particular emphasis on active wine and beer tours. The company is also organizer of the Wine Bloggers Conference, Wine Tourism Conference, and Wine Tourism Day in the wine world as well as blogger conferences in the food and beer industries. Wine has been an important component in travel for decades. Now, with craft beer, local food, and micro distilleries taking their own place in what is hot, vacations focusing on local food and drink are becoming even more popular. Zephyr will work closely with its industry partners to create exceptional experiences for its guests. Locations include a Kentucky Bourbon tour, a food tour in Peru, a Belgium beer tour, as well as a number of wine tours in key areas around the world. If you are interested to partner with us on Taste Vacations, please email cindy@ZephyrAdventures.com. The 2014 Wine Bloggers Conference took place July 11-13 in Santa Barbara County and set a new attendance record with 356 attendees, 2/3 of them wine bloggers and the rest sponsors, speakers, organizers, and others in the wine industry interested in social media and blogging. Attendees came from 32 different US states and Canadian provinces. The Wine Bloggers Conference allows wine bloggers to gather and meet each other, often for the only time of the year. In addition, the conference provides an opportunity to learn about the art of blogging - technology, writing, social media, etc - as well as taste great wines from the local area and around the world. The eighth annual Wine Bloggers Conference will take place August 13-16 in The Finger Lakes, New York. Registration is open now and space is limited to approximately 330 attendees. The 2014 Wine Bloggers Conference, scheduled for July 11-13 in Santa Barbara County, is nearing sold out status. With 300 registered attendees and another 40 reserved for existing sponsors, there are only 60 spaces remaining at the conference. Because of hotel space, there is a hard cap of 400 participants at this, the eighth conference. In addition to the many wine bloggers, industry participants attend to learn from and interact with wine bloggers and improve their social media marketing effectiveness. Sponsorships including the ablity to pour wine for bloggers are available. For complete information and to register, visit www.WineBloggersConference.org. For sponsorship information, email reno@zephyradventures.com. For complete information, see the Wine Tour Operator post on the Wine Tourism Conference website. The 2014 Wine Bloggers Conference, which will take place July 11-13 in Santa Barbara County, is nearly 40% sold out. 150 attendees have registered and the maximum capacity is 400. The 2014 WBC is the seventh annual event and the first conference in California since 2008 and 2009, the initial years. The conference is the annual gathering place of wine bloggers and those in the industry interested to work with bloggers or learn more about blogging and social media. The conference sells out nearly every year and organizers predict an early sell-out this year. The Wine Tourism Conference will return to California in 2014, with the event scheduled for November 12-14 in Paso Robles, San Luis Obispo County. Registration is currently open and space is limited to 250 attendees. The 2013 conference wrapped up in Portland, Oregon with attendees from 18 states, three provinces, and two foreign countries. The keynote address was provided by wine writer Linda Murphy and content ranged from digital marketing to tasting room management to creating strategic partnerships. The Wine Tourism Conference is designed to provide practical information that will allow attendees to grow and improve their own wine tourism operations, create networking opportunities with industry peers, and include optional excursions into the local wine region to visit wine tourism successes. The third Wine Tourism Conference will take place November 13-15 in Portland, Oregon. 200+ industry leaders of wine tourism from throughout North America and beyond will attend. Participants include wineries, winery associations, tourism associations, hotels, tour operators, press, and other wine tourism-related businesses. See the Attendee List online. The WTC agenda includes talks by national figures on wine tourism trends, detailed breakout sessions on concrete issues related to the subject, and time for networking with your peers. The goal is to provide real information each attendee can take home to increase his or her organization's wine tourism offerings. A pre-conference excursion to King Estate and the southern Willamette Valley, workshops designed for winery tasting room and marketing managers, a dinner at Willamette Valley Vineyards, and the first-ever Great American Wine Festival consumer event are optional additions. Please see the Wine Tourism Conference website for details and to register. The first-ever Great American Wine Festival will be held in Portland, Oregon on Saturday, November 16th. This unique consumer event will feature wines from throughout North America including lesser-known regions such as Ohio, Idaho, and Virginia and more-established regions in California, Washington, and Oregon. Exhibitor booths are free to vintner associations based anywhere in the US or Canada. An association member must be registered for the Wine Tourism Conference, which takes place November 13-15 in Portland. Sponsorship opportunities are also available to join our existing list of supporters including Whole Foods, Yelp, Amazon Wine, WineAmerica, LocalWineEvents.com, and many other organizations. The Wine Bloggers Conference announced on Saturday that the 2014 conference will be held July 11-13 in Santa Barbara County, California. This is the first time the conference has returned to California since the initial two years in 2008 and 2009 and attendance is expected to be at a record level. The 2013 Wine Bloggers Conference wrapped up on Saturday in Penticton, British Columbia. For a review of that wine area and the conference by an attending blogger, see http://throughthebunghole.com/okanagan-valley-wine-culture-in-a-bottle/. Registration is now open for the conference at www.WineBloggersConferenece.org. For sponsorship information, please contact Reno Walsh at reno@ZephyrAdventures.com. Sponsorship is excellent way to showcase your wines or jumpstart your social media presence. The first-ever Wine Tourism Day on May 11th has 180 events scheduled throughout North America. Please join this industry effort by adding an event at your winery or wine-related business. Wine Tourism Day is an industry effort designed to highlight the visiting of wineries as an excellent option for consumers' time and money. Consumers have many choices to make when considering a vacation or an afternoon excursion and Wine Tourism Day helps keep the wine industry at the forefront of consumers' minds. Please join your fellow industry members in this non-profit, group effort to promote our industry. The Wine Bloggers Conference is now in its sixth year and will take place June 6-8 in Penticton, British Columbia. This will be the first conference in Canada. Last year's conference attracted 360 wine bloggers and others engaged in social media in the wine industry. 2013 sponsors includes Tourism British Columbia, Wines of British Columbia, Rodney Strong, and over 30 individual British Columbia wineries. Sponsorship opportunities are still available. Most blogger attendees will actually be from the US, so sponsors can engage with key social media influencers from throughtout North America and beyond. For complete sponsor information, please contact reno@zephyradventures.com. The first-ever Wine Tourism Day in North America is scheduled for May 11th. Wineries, restaruants, hotels, and other wine-related businesses throughout North America are encouraged to host an event of your choice. By working together, we can encourage consumers to visit wine areas for their vacations rather than heading to the beach or Disneyland! Promotion to the public will begin March 1st, so please try to add your event this month. Please visit the www.WineTourismDay.org website for full details and to register your event.